As I wrote in "QE or Not QE: Even Economists Need Lessons in Quantitative Easing, Bernanke Style," Martin Feldstein is a very important, influential and intelligent economist. 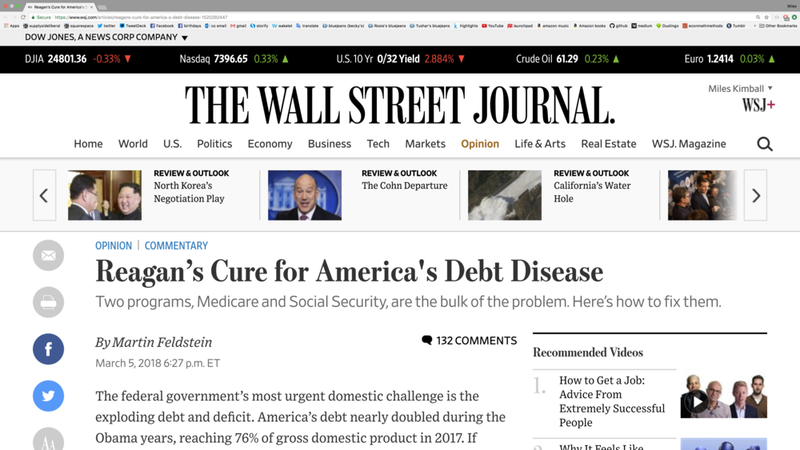 So it is disappointing that he has no new ideas to offer in order to rein in the trajectory of the US national debt in his latest Wall Street Journal op-ed, "Reagan’s Cure for America's Debt Disease." Martin Feldstein suggests that we can raise the retirement ages built into Social Security's formula and increase premiums for Medicare for those with higher incomes. Proposals like this have been around for a long time. They would both be quite painful to many people and not do enough to rein in the trajectory of the US national debt. One particular problem with raising the retirement ages built into the Social Security formulas is that it would lead to more people trying to claim disability insurance; determination of eligibility for disability insurance generates considerable transactions costs. A late retirement age for Social Security is particularly difficult for blue collar workers who have had physically grueling jobs. It is also hard on people who simply have less money. Furthermore, the poor tend to die young, so that delaying Social Security has a large effect on the total amount they get. Let me lay out some ideas that are less painful, while avoiding any strong incentive for people to reduce their work effort or to make other changes that are socially wasteful. 1. Raising the Social Security Retirement Age Only for the Well-Off. One way to deal with the fact that a later retirement age is cruel to the poor is to have a gradual increase in the normal Social Security retirement age (and the early Social Security retirement age) be limited to individuals who have a high level of total lifetime Social Security earnings. This is a much better way of doing means-testing than making Social Security benefits or Medicare premiums depend on current income. For people near retirement, for whom most of the total lifetime Social Security earnings are far in the past, it shouldn't create much of an incentive to reduce work effort. And even for young workers, any additional incentive to work less would (a) require a well-above-average level of foresight, (b) caring a lot about the distant future and (c) a change in lifestyle since the change in labor income would have to be long-term. Because the nonprofit sector is more decentralized, it involves a more diverse body of key decision-makers and so can be more creative than government. In the nonprofit sector, it is easier to sunset programs that don’t work well than in government; people can stop donating to them. Even if giving to some charity is required, giving to a charity of one’s choice is much more fun than forking over taxes to the government. Therefore, people will distort their behavior less to avoid required charitable donations than they would to avoid taxes. Through cognitive dissonance, many who are required to give to charities will end up thinking of themselves as more altruistic and end up actually becoming more altruistic (including for many donating time as well as money to a charity). This tendency will be reinforced by discussing with friends what charity to give to. And children will be brought up surrounded by a culture of giving. Thinking about which charity to give to will help educate people about the issues surrounding public good provision. I argued in "No Tax Increase Without Recompense" that a "public contribution system" of requiring people to either pay more taxes or increase their "public contributions" by the same amount could avoid a big increase in the national debt while still making sure key things get taken care of. We want to get a lot of public goods—including knowing that our elderly are well taken care of. We can get those public goods while still letting people have the fun of deciding where their public contribution should go. This would be much like our current system of charitable donations, with a lot of choices for individuals about how their money would be used, but somewhat more focused on things that the government would otherwise have to do, or should be doing if it is not taken care of by private efforts. If we simply resent "the rich," or feel that "the rich" have too much power, then a key objective of a tax increase might be to force them to give up their money and let that money be spent in a democratically determined way. (Here are I am trying to channel some of the comments I have received from people objecting to my idea for a public contribution system.) In that case, the system could be designed to cap the amount of extra taxes that could be avoided by making public contributions (at some cost of reducing the incentive to become rich.) But those who we don't put in the mental category "the rich" also need to be required to either pay more taxes or give more to charity, or we won't get enough things done. Our mental category of "the rich" tends to be small enough that there just isn't enough money among "the rich" to get all the public goods we should have. European countries that have a lot of government spending make middle-class people pay a lot of taxes. They don't manage to do it by taxing "the rich" alone. 4. More Scientific Research on How to Fight Obesity. A large share of Medicare costs come from diseases associated with obesity. Many of these are chronic diseases are expensive to treat the way we treat them now. But they might be relatively inexpensive to prevent. A good example of the kind of research that can really help is the DIETFITS Randomized Clinical Trial that I wrote about earlier this week in "Why a Low-Insulin-Index Diet Isn't Exactly a 'Lowcarb' Diet." In that post and the posts flagged at the bottom of that one, you can see my thoughts about how to fight the rising tide of obesity, including some ideas about questions that need to be researched. The DIETFITS study cost $8 million, which is peanuts compared to the Medicare costs that can be saved due to the insights it provided. But because of the funding situation, this study was only funded after 7 grant rejections. What a travesty to let there be so many obstacles in the path to doing such research! We need many more studies like this, testing many hypotheses about what will work in bending the curve on obesity. The US government is being penny-wise and pound-foolish if it doesn't dramatically increase the funding for research on fighting obesity. If funding is tight for obesity research, it doesn't just reduce the total amount of funding for obesity research, it reduces the share of that research pie that is truly daring, that could overturn established orthodoxies. When most grants get rejected, the few that get through are usually those that hew to whatever the orthodoxy is in a field. Conclusion. The increase in national debt that we will see if current policies are continued is indeed a problem. But Martin Feldstein offers only old ideas. There are better ways to tame the US national debt in the face of the aging of the US population.